Hatters boss John Still is reluctant for influential midfielder Luke Guttridge to undergo another operation on his injured metatarsal. The 32-year-old has missed the last two games after suffering a recurrence of the problem that kept him out of Town’s title run-in last term. He will now undergo a course of injections, as Still admitted going under the knife once more could possibly signal the end of his playing career. 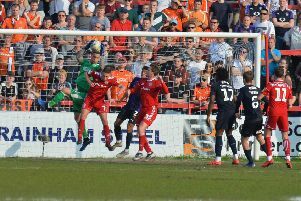 Town’s manager said: “Of course (I’m worried) because he’s had the operation before, had a pin in, it’s given him another problem and we have to explore this, how much we need to do or not do. “We could go back to the drawing board and do the operation, but that carries quite a big danger, if Im being honest, in terms of playing again. “So lets have a look at the injections and we’ll know a bit more once he’s had this course. We don’t want to go down the line of having another operation as it’s such a small bone and the screw in it, if you start messing about with it, it’s probably not the ideal thing to do. “We need the bone to calcify again a bit more and the injections will help that. “If you start talking about taking the screw out and putting another screw in, it’s quite delicate, so we’re not sure about that.